G4K Lovely Heart Cat Escape info about the game-Games2Rule. A lovely heart cat lived in a beautiful and magnificent town. That lovely heart cat was pretty good looking. The lovely heart cat was stuck in a palace there a day. Your duty is to save the lovely heart cat from there. 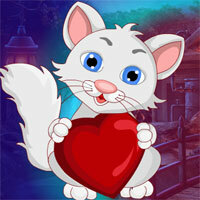 It will be helpful to find the hidden clues where the lovely heart cat is saved from there. Find all the clues and get that lovely heart cat out of there and congratulate you to win the game. The tricks of the trick are a little harder to find, but somehow it may be a matter of interest. This game is highly desirable.